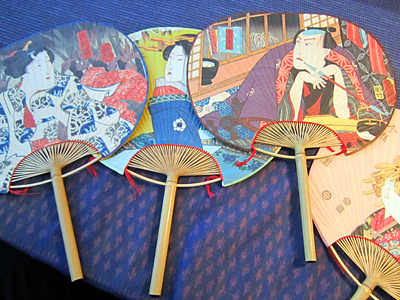 Thayne-san, today we’ll be visiting a Japanese hand fan shop called “Ibasen,” in Nihonbashi-Kobunacho. It has a long history, having been founded in the eighteenth year of Tensho (1590)1590. Afterwards, let’s take a look inside the shop on the first floor. I’m looking forward to it. This The little gallery in the hallway to the elevator looks wonderful. The Hina-ningyo dolls on display for the Doll’s Festival are beautiful. Old merchants often have lots of handicrafts and other works of art like these. Hello, Thayne-san, thanks for coming. I’m Yoshida Masao of Ibasen. 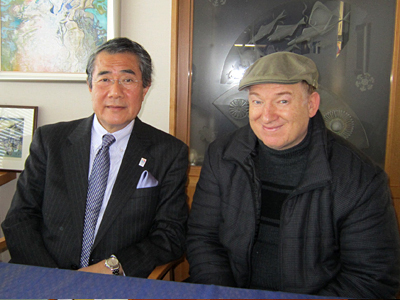 Hi, Yoshida-san, it’s great to meet you. Even among the Toto Norenkai member shops I hear yours has an extra-special history. Tell me, what generation owner are you? Wow, So all the knowledge and skills for your work have been passed down from father to son for fourteen 14 generations? Actually, it hasn’t always been from father to son; there have also been adoptions of convenience. During the Great Ansei Earthquake, for instance, the shop’s successor was tragically killed, and in another case, a distant relative was asked to take over because they were a better fit for the job. A lot of things can happen when you try to keep a business running for many decades. Overcoming the crises takes more ability than blood relations. Incidentally By the way, where was Ibasen’s founder originally from? The first generation owner was from Hamamatsu. His name was Ibaya Kanzaemon. He followed Tokugawa Ieyasu to Edo and was employed by the Shogunate, mostly making washi paper and bamboo goods. This was the beginning of the company. 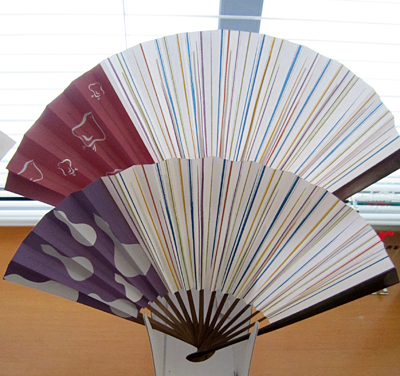 Later he started a new business with the shop’s paper and bamboo products―making : making uchiwa hand fans. Ah! You can make uchiwa with just paper and bamboo! That’s right! . Then, in the latter part of the Edo Period they started adding designs drawn by popular ukiyoe artists such as Hiroshige, Shodai Toyokuni, and Kuniyoshi. This was a huge hit and they sold extremely well. During the time we dealt in “uchiwa ukiyoe” the publishing name “Ibaya” became well-known. Thayne-san, the ukiyoe of Ibasen are not only famous in Japan, they can be seen in the British Museum, the Museum of Fine Arts, Boston, and the Metropolitan Museum of Art. Thayne-san, have you ever taken the time to really examine Edo uchiwa? If you look carefully, you can see that every piece of bamboo is cut very finely and equally in size. The skill involved is amazingincredible. Are they made entirely by hand? Of course. Each piece of bamboo has its own characteristics, its own quirks, and we cut the bamboo while taking that into account. As a result, each fan is both stronger and more flexible, and better at fanning air towards you. And they’re beautiful, as well. Yes, very! Do the artisans with this extraordinary skill live in Tokyo? In the past, there were many of them in the city, but these days most of them work in the suburbs such as Chiba Prefecture. Once electric fans were invented, and later air conditioning, sales of hand fans sold much lessdeclined and the number of artisans who made them dropped dramatically. Nevertheless, the artisans didn’t disappear completely. Someone has to pass on the knowledge and culture to future generations, something that can’t be done if the artisans don’t have steady employment. That’s where Ibasen comes in. In order to preserve the traditional ways of production, an artisan has to be able to make a living from that work alone. 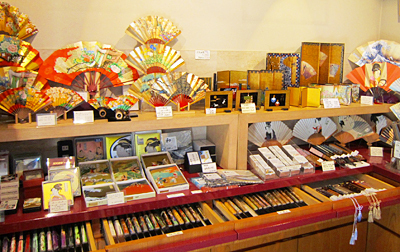 It’s up to us consumers to purchase Japanese hand-made goods to support them. Do you think the uchiwa and folding fans business will be tougher in the future? Yes, I do feel am concerned. For a long time after the war, sales steadily declineddropped. However, more recently, with greater public awareness of global climate change and the need to conserve electricity and be green, sales stopped falling. Then there was the nuclear disaster two springs ago. There was a large-scale push to save power, and hand fans sold like hotcakes. It’s ironic, but sure I guess it really helped your business. By the way, did you receive some kind of training somewhere else yourself? Really? That’s a surprise. It’s a completely different line of work. Yes. I’m the second son and grew up without any thought of taking over the family business, and so I used to live have a full life as a businessman. But then my older brother found something else he wanted to do and decided not to take over from our father; that’s when they talked to me. I think it took my father about two years to convince me. Finally, he brought someone important along with him and came all the way to Osaka, where I worked, and I felt he had won. What was it like working in the family business? Were a lot of things hard to get used to? People tend to think engineers sit in front of a machine all day, but actually you also need to communicate with others; in fact, that’s what’s most important. So actually there was a lot in common with my engineering job―mostly ; namely, working with people. I see. Has the shop changed since you came back to Tokyo and took over from your father? Well, shops in business for many generations have to change with the times in order to survive, so we have changed, but not because I took over. I think our Edo Period designs are wonderful, but if we were still using the exact same designs today, they would quickly lose their novelty and appeal. That’s why we borrow the Edo designs but modify them, using modern colors and other changes to keep them fresh. We don’t want to push the Edo style on the current generation of Tokyoites; instead we have to appeal to modern sensibilities. In other words, we have to adapt to our market. Incidentally, I’m currently working on expanding overseas, targeting the affluent population of Asia. Asia! So that means you’ll need designs and stories of people outside of Japan. That’s right. So for help we’re consulting with people in the fashion industry, people with whom we’ve never worked before. Working together with folks in many kinds of traditional industries has been really stimulating. We’re especially getting lots of help from people in Kyoto. Having cultivated a profound culture over such a long history, it’s an old, yet new, city. Academic professionals support the value of industrial arts and crafts, and also bring cutting-edge information. That’s one strength of Kyoto. Yes, that’s really true. Ibasen was founded in Edo and is proud of its Edo/Tokyo heritage, but when selling our products worldwide I think we must act as representatives of Japan. Indeed. Please let us know if there’s anything we can do.